Canadian racing had come a long way as to competitiveness on the world stage by the time Chief Bearhart burst onto the scene in the mid nineteen nineties. “The Chief” as he was known to his stable and fans, continued the new tradition of Canadian excellence in competing and winning many of the world’s biggest grass races on the racing calendar. He was consistent, classy and gave his compatriots plenty to cheer for during his Hall of Fame career. Chief Bearhart was bred in 1993 by Ontario breeder Richard Maynard. Maynard sold the chestnut son of Breeder’s Cup winner Chief’s Crown – Amelia Bearhart by Bold Hour to Ernie Samuel, the founder of Canada’s powerful Sam-Son Farm, in 1994 as a yearling. Samuel had been building his stable and breeding program into a force in not only Canada, but also throughout North America. He had already campaigned twelve champions, most of them were homebreds, when he purchased his next champion in Chief Bearhart. Mark Frostad was the trainer of the Sam-Son stable when Chief Bearhart entered his barn. Chief Bearhart was a big somewhat gangly colt as a juvenile and as such the experienced Frostad took his time with him. Chief Bearhart also suffered a bone chip in an ankle during his juvenile year which kept him to only one start. The pedigree of Chief Bearhart suggested that he would be more suited to running on the dirt. He did however make two starts on the turf to begin his three year old campaign notching a win and a second racing at Keeneland and the Fairgrounds. Frostad put that information in the vault. The target for Chief Bearhart was the Queen’s Plate, so Frostad trained him on the dirt and entered him only in races on that surface. Chief Bearhart was showing promise but not experiencing high level success. He did finish third in the Plate Trial Stakes, but in the big event Chief Bearhart finished fourth to Victor Cooley. Frostad entered The Chief in an allowance grass race for his next event. Well a revelation took place when Chief Bearhart wired a strong field and set a new eleven furlong track record. He then entered the Breeder’s Stakes and won the Canadian classic by nine and a half lengths. Chief Bearhart would never again race on a dirt track. The Canadian International was next. Sam-Son had won the race four years earlier with another big chestnut in Sky Classic. Chief Bearhart finished second to the popular Singspiel, a son of Canadian legend Glorious Song. The turf was soft that day which suited Singspiel more than Chief Bearhart. The Breeder’s Cup Turf was due next on the same Woodbine turf course. Chief Bearhart did not close with his usual blazing speed and finished well back. Sam-Son decided to rest their emerging star for the winter. Frostad brought Chief Bearhart out for his first four year old race on April 11, the Maker’s Mark Mile at Keeneland. The Chief put in a furious rush on the outside making up nine and a half lengths down the home stretch, but fell short of a half length to Lassigny. The race was a one mile affair. Chief Bearhart needed more distance to show his true potential. He got that two weeks later at Keeneland in the Elkhorn Stakes. The Chief stormed home the winner of the twelve furlong race. The race marked his fourth triple digit Beyer rating in his past five races. He would not be under triple digits, save for one race, for the rest of his career. Frostad brought him home for the King Edward Stakes, which was a cut back in distance. Nonetheless, The Chief won by three and a half lengths ahead of the good horses Crown Attorney and Kiridashi. Chief Bearhart next went to Arlington Park for the Stars and Stripes Turf Handicap. Lakeshore Road, carrying six less pounds, upset The Chief in a head bob at the wire. Undaunted, the Sam-Son team brought him home for the Sky Classic Stakes. Chief Bearhart dominated the eleven furlong race to win easily by six lengths over American invader Honor Glide. A new star was shinning bright. The Chief developed into one of the best turf runners of his generation. To add to his growing popularity, Chief Bearhart liked to come from off the pace with his devastating finishing kick, which thrilled racing fans. He gave the fans many thrills. Now it was time to take on invaders from around the world and try for a Canadian International victory. Jose Santos had become the regular rider to Chief Bearhart. He suited the chestnut’s come from behind style and rode him beautifully. The Chief announced his intentions in the previous year’s running, but came up short to a more seasoned and worthy foe. This time The Chief was the seasoned pro and performed accordingly. Chief Bearhart captured his country’s richest race with a smashing two and a half length victory in the Canadian International. Next up was the rich Breeder’s Cup Turf, run in 1997 at Hollywood Park. As usual, a stellar field of starters from around the world gathered for the race. Chief Bearhart put in one of his sweeping runs from the back of the field, going five wide around the last bend and charged down the home lane. Gathering speed and passing horses as he went, Chief Bearhart powered past the leaders and held off a hard charging Borgia to win the BC Turf by a length. Sam-Son decided to bring Chief Bearhart back for a five year old campaign. While it was a good solid year, Chief Bearhart did not achieve the success he had had the previous year. The Chief did win the Manhattan Handicap, his second Sky Classic Stakes and the Niagara Stakes. He finished second in the Elkhorn Stakes, his first start of the season, and the Canadian International. He was competitive in every race, but the devastating closing speed he displayed before was not quite what it used to be. His final race came in the Japan Cup, in which Chief Bearhart finished fourth but was closing on the leaders. The Japanese were smitten with Chief Bearhart. The Shizunai Stallion Station offered Ernie Samuel a tempting offer to buy and stand Chief Bearhart for stud. Samuel accepted and so the Canadian champion stayed in the land of the rising sun after his racing career. Chief Bearhart retired with full honours. Two times Canadian Horse of the Year, three times Canadian Champion Turf Horse, once Canadian Champion Older Horse and once Eclipse Award Champion Turf Horse. Chief Bearhart did not have a very successful career as a sire however. He got fourteen stakes winners from six hundred and eighty-one foals. He shuttled from Japan to New Zealand for three years during his stallion career. His offspring tended to be like him, later developing longer distance types. 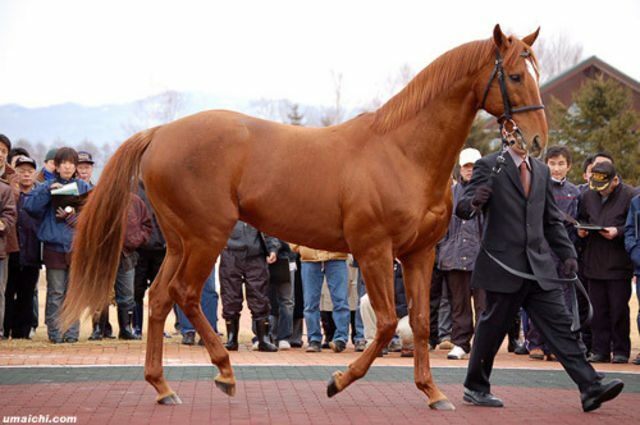 His most successful get were Meiner Kitz (Tenno Sho), Meiner Recolte (Asahi Hao Futurit Stakes), Shikoba (Eight Carat Classic, Fillies Classic), and champion steeplechaser Merci A Time (Nakayama Daishogai). Sam-Son Farm enjoyed the success of Chief Bearhart to such a degree they bought into the family of his dam on several occasions. The Chief’s half sister Ruby Ransom won the Ontario Colleen Stakes before she became a very good broodmare. Her second foal, a chestnut son of Theatrical, was purchased by Sam-Son in 1999. They named him Strut The Stage. Strut The Stage won one and a half million dollars for the stable. Multi graded stakes winner Strut The Stage was very similar to Chief Bearhart in racing style. Another family member Sam-Son bought out of Ruby Ransom was her daughter by Quiet American. Given the name Brave Destiny, this member of the family went unplaced in her only start. Later for Sam-Son, Brave Destiny produced multiple stakes winner Aldous Snow from a cover by Theatrical. In a twist of irony, Aldous Snow has won the graded Singspiel Stakes three times in his career. Chief Bearhart was elected to the Canadian Racing Hall of Fame in 2002. The Chief earned $3,381,557 in a twenty-six race career. He won twelve of those races, finished second five times and third three times. Six Sovereign Awards and an Eclipse Award are proudly displayed at the Sam-Son main office in Milton, Ontario. Chief Bearhart passed away from heart failure on September 18, 2012. Although considered a dirt horse before he began to race, Chief Bearhart proved that stereotyping a horse is folly. The turf was his domain. He was a classic stayer on the grass. A delightful throwback to when conserving speed was king. The Chief could “Get ‘em outta their seats”. He was excitement.